Azam Uganda Premier league Round 18. Azam Uganda premier league champions Vipers moved back to the top of the table after a comfortable 2-0 victory over Mbarara City last evening. This is the first time Vipers lead the way in close to six months. The Kitende-based side had January signing Daniel Muzei Sserunkuma to thank for the result as the former Express and Gor Mania striker grabbed his first brace for the club. Sserunkuma moves on top of the top scorers chats with nine goals and has now scored four goals in four games ever since joining the Venoms last month. His first yesterday came on 11 minutes when he curled in a superb strike following good link up play with fellow foward Erisa Ssekisambu. 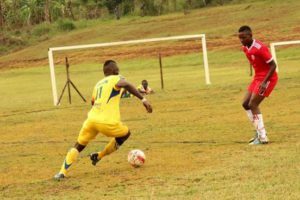 The diminutive forward was again on the mark 13 minutes later with a poke ball past Mbarara City’s custodian Muhammed Ssekeba following spade work by the hard working right back and captain Nico Wadada. Vipers suffered a set-back with three injured players as the trio of Moses Waiswa, Ssekisambu and goalkeeper Isma Watenga all ended the game with injuries. Vipers now sit on top of the league summit with 35 points off 18 matches, two points ahead of second placed SC Villa Jogoo who have a game in hand. Elsewhere, Express FC were dealt a huge blow in their quest for survival as the Red Eagles succumbed to a 2-1 loss at Bright Stars. Former KCCA FC striker, Nelson Senkatuka scored both goals for the Matugga based side while on form Alfred Leku grabbed the Red Eagles consolation. Senkatuka gave the hosts the lead six minutes to half time but Leku struck five minutes later to ensure the first half ended one apiece. In the second half, both teams pressed for a winner but it was Bright Stars who found it with 22 minutes to go. Bright Stars move to 9th on the table with 22 points from 17 games while Express are now at the bottom of the log with 15 points having played a game more than the Stars. The league will take a break till the 28th of this month when both SC Villa and KCCA will be in action. Record league champions SC Villa will host URA in Masaka while two time league defending champions KCCA FC travel to Entebbe to take on Masavu at the Fisheries Institute in Bugonga.